SolTerra Communications is excited to release a new website tool for web developers and IT professionals. Web developers often discover that their clients know very little about the important Domain Name System (DNS) zone files and registration information pertaining to their existing domains and websites. Domain owners often times don't know who officially owns their domain, what company the domain is registered through, and what the domain's zone file looks like. 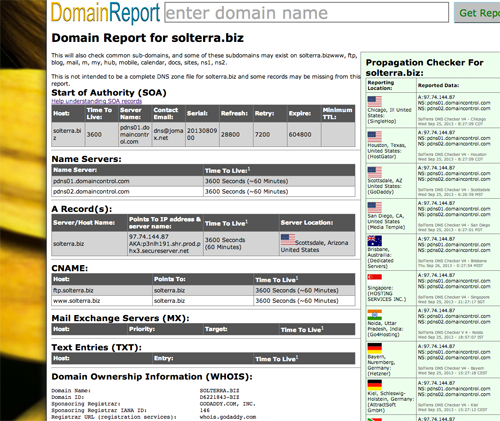 SolTerra Communications has developed domain-report.info to put this important information all in one spot. Enter your domain into domain-report.info and this report will give you its best estimate on what the current domain zone file looks like, a complete WHOIS report that includes the name of the official owner, and what company registered the domain. All of this is combined with a world-wide DNS propagation checker to see if the recent edits you've made to your zone file are appearing correctly for end users of your website. Currently there are over 10 locations around the globe, from Chicago, to Singapore, to South Africa, that all relay where they are finding your website and email servers. "I originally developed this tool for in-house use at SolTerra, but I quickly realized this tool would be useful for many others," says Jeff Huxmann, owner of SolTerra Communications. 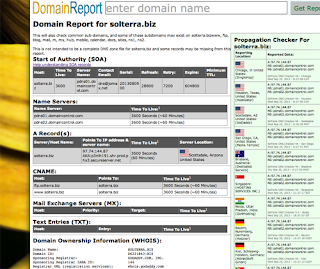 "Domain-report.info consolidates the important information on a domain into one report I can hand to a client and explain exactly who owns their domain, and how their email is routed. Using the propagation checker, I can tell a client with certainty that their new website has gone live successfully. On a more technical level this tool trys to re-create what a zone file looks like and this can help web developers transfer the zone file to a new server. This is especially useful if you don't have direct access to the current zone file. Currently DomainReport is a free service open to the public and paid for by users who click on display ads.